This took me almost four months to replace. It looks extra classy with all but one bulb burned out. It lets people know that this house is a work in progress. I was shooting for a light fixture that people wouldn't much notice (did I succeed?) because there's an awful lot going on up there. 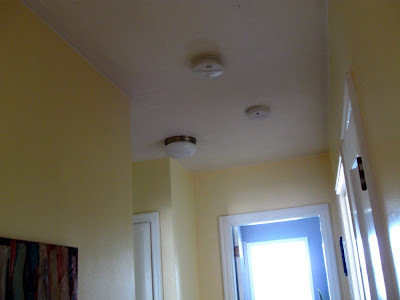 Smoke detector, carbon monoxide detector . . . or maybe I should go whole-hog and hang a mobile? 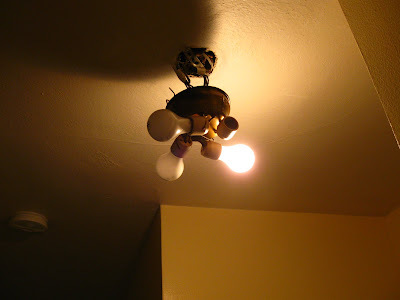 As an aside, I chose a flush-mount fixture mostly because it was cheap. The underside part, the part that meets the ceiling, is backed with insulation. Insulation is not only itchy, but it also makes it unbelievably difficult to thread a screw blindly into a hole in the ceiling. I will not buy one of these again. 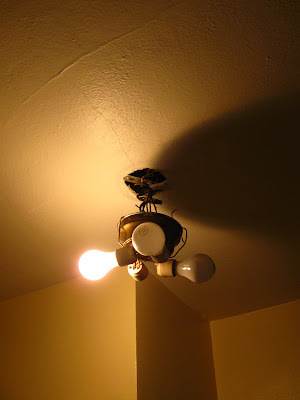 I have got to re plaster my room in a couple of days, not looking forward to doing all the areas around my light fittings. It has been come a bit loose over the years so im going to have been careful.